This is the third and last installment in the adventures of John Carter. 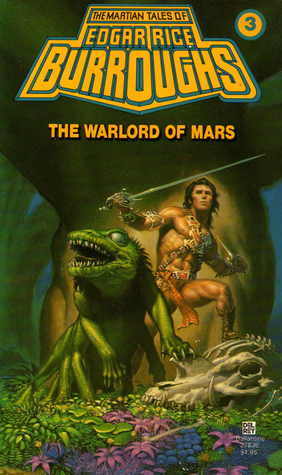 As the Barsoom series continues the stories of others. John Carter is still tracking the movements of his beloved princess Dejah Thoris, he keeps getting close and failing to get her. In this final book we meet the Yellow Martians. I also start to think that John Carter is a little dense, he seems to forget things rather quickly, then recall them when it is too late. Maybe he has suffered too many hits to the head. Another entertaining tale, steady plot line, not many twists and turns, lots of fighting and intrigue, deviousness from John Carter and his enemies. Not many threads to tie up here but a fun read. Posted by Belleza on May 3, 2012 in 2012, Science Fiction and tagged 3 Stars, Barsoom Series, Carthoris, Dejah Thoris, eBooks, Edgar Rice Burroughs, John Carter, Tars Tarkas, Thuvia.